Kyiv, 3 December 2018, - What challenges Ukraine is facing in terms of standing up for human rights? How the conflict in the eastern Ukraine affects Ukrainians’ rights and freedoms? What challen­­ges do the people face in the course of decentralization reform? This and other issues were discussed during the Forum “70 Years of the Universal Declaration of Human Rights: Agenda for Ukraine”, organized by the Parliament Commissioner for Human Rights in cooperation with United Nations Development Programme in Ukraine (UNDP) and financial support from the Ministry of Foreign Affairs of Denmark. The event brought together representatives of national authorities, international organizations and civil society, to discuss the most pressing issues for human rights in Ukraine. 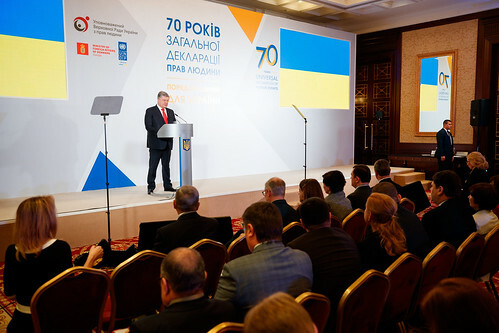 Welcoming the Forum participants, Petro Poroshenko, the President of Ukraine stressed: “Today’s meeting marks a milestone historical event which has formed the image of today’s world. On 10 December 1948, the United Nations General Assembly adopted the Universal Declaration of Human Rights. At that time humanity started building a new post-war world where the person’s life, dignity, and freedoms were perceived as the key values”. “As one of the most important documents of humankind, the Declaration is central for defending and protecting the human rights of every group and every individual across the globe. As Ukraine strives to overcome many challenges, including conflict and implementation of an ambitious reform agenda, this Forum is an opportunity to discuss how the Declaration – together with the more recently adopted Agenda 2030 on Sustainable Development – can serve as a guide for ensuring that human rights are at the centre of Ukrainian laws, policies, and practice”, underlined Osnat Lubrani, UN Resident Coordinator, Humanitarian Coordinator, and UNDP Resident Representative in Ukraine. The Forum participants discussed the conflict-related issues, including violations of right to life and liberty of people living in the non-government controlled territories of Donetsk and Luhansk oblasts, recruitment of children in illegal armed groups during the armed conflict, violation of the rights of internally displaced persons, as well as human rights in the context of national reforms. According to the recent all-Ukraine survey on human rights, Ukrainians value freedom most of all: 86% of Ukrainians consider it as the fundamental value. Even though safety remains one of the top priorities (66,5%) due to the conflict, freedom is the key value for Ukrainians. The sociological survey was conducted in 2018 by the Ilko Kucheriv Democratic Initiative Foundation jointy with with Human Rights Information Centre. It was commissioned by the Strengthening Capacities of the Office of the Ombudsperson project, implemented by the United Nations Development Programme in Ukraine (UNDP) with the financial support from the Ministry of Foreign Affairs of Denmark.